This is a description of the transceiver I started building in 2009. It is a software defined radio receiver and transmitter on one board. It is the heart of my current station, and I don't use any other rig at my shack. Detlef Rohde DL7IY and Gunter Richter DL7LA published an article describing the design in the August 2010 issue of Funk Amateur (in German). My article appeared in the January/February 2011 issue of QEX. You should use the most recent firmware available. But if you already have firmware installed, you do not need to update unless you need the new features. Stefan, DL2STG, publishes FPGA firmware that offers advanced features. These versions still work with Quisk. His FPGA firmware can return blocks of raw samples so you can perform an FFT of the whole 60 megahertz bandwidth; and it offers higher sample rates of 1920 ksps at 16 bits, and 3840 ksps at 8 bits. The most recent version as of February 2013 is FPGA-1.3-sg2, but look for the most recent version at http://dl2stg.de/stefan/hiqsdr/fpga.html. April 2013 firmware version 1.4 is now available. This version allows you to change the IP address of the hardware from the PC instead of using the address programmed into the firmware. It also changes FPGA pin 56 to be an output pin; high for normal, and low for full duplex (FDX) operation. A new firmware version 1.3 is now available. This version fixes a problem with spectrum flatness when sampling at 960 ksps, and adds the special features used by the Quisk VNA program. The VNA program "quisk_vna.py" enables the hardware to be used as a vector network analyzer, and it requires this firmware or above. transmit FM, or you wish to query the hardware with the "Qs" command (for example by Hamlib). A new firmware version 1.1 is now available. It works fine with the original hardware, but also supports the extra features of the HiQSDR. Specifically it supports the X1 connector FPGA pins 69, 68, 65, 64 (band in use) ; preamp pin 63; transmit LED pin 57; the attenuator pins 84, 83, 82, 81, 80; and the antenna switch pin 41. There is also a new PTT (push to talk) input pin 176 that is used instead of the key input (pin 177) for SSB. Be sure to use this pin for SSB instead of the key pin if you use the new firmware. This new firmware requires Quisk version 3.5.5 or later. For the original hardware you must set use_rx_udp to 1 in your config file, and for the HiQSDR you must set it to 2. The original firmware was version 1.0. It still works fine with newer versions of Quisk. There is no need to upgrade your firmware unless you need the new features. Note that the firmware version you are using appears on the config screen. Be sure to set use_rx_udp to 1. My 2010 software defined radio (SDR) project is an SSB and CW receiver and exciter on the same board. It is the successor to my SSB exciter from 2007. It improves on the 2007 hardware by using a 10/100 Ethernet controller, eliminating the microcontroller bottleneck, and including a receiver on the same board. You should still read my May/June 2008 QEX article for background. An 10/100 full duplex Ethernet controller and its RJ-11 jack. All communication is over UDP packets on Ethernet. The FPGA program supports Ping, ARP, Tx samples, Rx samples, tuning and status. An analog to digital converter (ADC) and its preamp for receive. A digital to analog converter (DAC) for transmit. 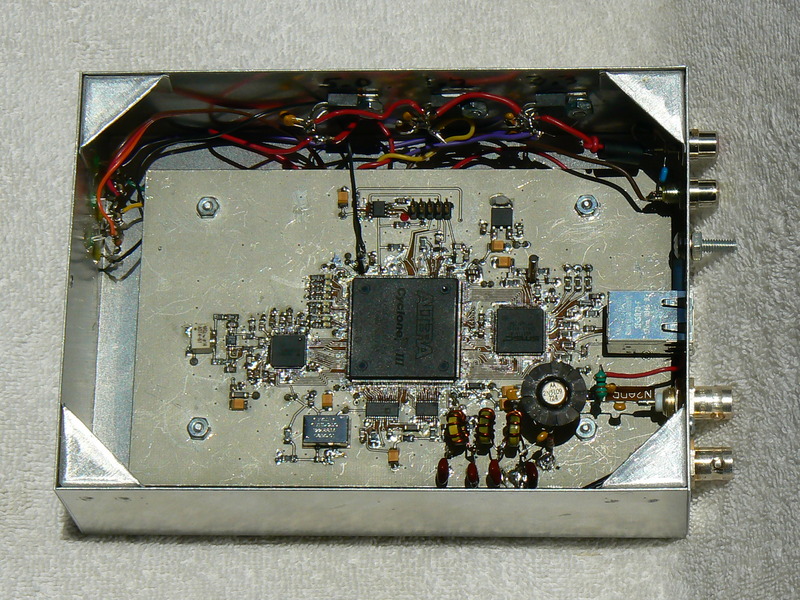 A low jitter 122.88 MHz clock. The FPGA is an Altera EP3C25Q240C8N, 240 pins, programmed by an EPCS16SI8N. The clock is a Crystek 122.88 MHz CVHD-950-122.880. The box is a cap cover L190, size 5X7X2 inches. A few people have expressed interest, so I am providing the design files as an open source project. Please note that THERE ARE NO WARRANTIES. I have a full time job, and can supply only a little support to interested parties. If you want to play with software defined radio and need a place to start, feel free to study or build this project. I suggest you mount just the FPGA first, and test it with the usual LED blink program. Then mount the Ethernet controller and test it with Ping. Then you can mount the more expensive ADC or DAC or both. This project is just a transceiver. To make a complete station you need amplifiers and filters. A block diagram and description of the rest of my station is here. Here is a screenshot of Quisk running with the new hardware. It shows the whole 40 meter amateur band sampled at 480,000 samples per second. Here is a photo of the hardware and a photo of the PC board. The PC board design is finished and was done with Eagle. The design files as of December 2009 are in eagleboard.zip. This is a rev 2 board and there are some problems you may want to fix if you are going to make more boards. The TO-220 voltage regulators are not on the board, they are mounted on the box, and the DAC output amplifier is added to a bare space on the PC board. The schematic is here. The board is two-layer because multi-layer boards are very expensive in quantity one. But this creates problems with noise. To reduce noise, I left as much copper as possible on both sides. As a result, there are a number of jumpers that must be added. The board should really have at least four layers. To add jumpers to the back of the board, start the Eagle PCB software, and look for yellow "air wires". These are the jumpers you need. You can also use the highlight feature on a through-hole pad to see which other pads light up. All jumpers have pads. You must solder the pad on the bottom of the ADC preamp to ground. First mount the preamp. Then turn the board over, and note that there is a plated-through hole on the board at the center of the preamp. Add a bit of flux to the pad using this hole. Then use a narrow soldering iron tip to wet the pad with solder. Let the solder flow onto the hot pad, and then quickly fill the hole with solder. Finish by flowing the solder over onto the ground plane. Work quickly, or you might disolve the plating on the hole. The pads for the Schottky diodes and the ferrite chips should be larger. There should be a bleeder resistor for the 2.5 volt regulator (minimum current spec). The holes for the 2X5 programming pin header are too big. There should be more space around the through-hole pads. The LED eight lamp array is too bright; increase the resistor value. Perhaps put some of the voltage regulators on board instead of on chassis. The input power is 6.0 volts, and I mounted TO-220 regulators on the chassis for 5.0, 3.3 and 1.2 volts. The 2.5 volt regulator is on the board. I built the DAC low pass filter and preamp on the board using "ugly" construction (there are no board traces). The alternative is to run the DAC output directly to the BNC. The board has a lot of empty space for this type of modification. The transceiver is controlled by my Quisk software. If you do not want to use Quisk, just attach your own software. Audio samples from the receiver are pairs of 24-bit I/Q samples starting at UDP data position 2 (Ethernet position 44). The first byte of UDP data is a sequence number that you can ignore, or use to check for errors. The second status byte carries the key up/down state and an ADC overrange bit. To transmit, send two 8-bit zeros followed by 16-bit I/Q audio samples to UDP port 0xBC79 at a 48 kHz rate. For control, check the simple UDP code in quisk_hardware_n2adr.py. The FPGA software is written in Verilog for the Altera free Web Edition development environment. You will need a programming cable to connect the 2X5 header to your PC. I use the Terasic P0302 USB cable (Digikey P0302-ND) instead of the more expensive Altera cable. The FPGA project files are now final (or as final as homebrew projects ever get). The decimation from the 122.880 megahertz clock is 8 times the decimation specified in the config file (2 to 40) times 8. That results in a final sample rate of 48000 to 960000 samples per second. At 960000 sps and 48-bit samples, the Ethernet bandwidth is 46 megabits per second plus 1.5 mbs for transmit plus overhead, or about half the available 100 mbs Ethernet bandwidth. 2013 November: Continuing work on HiQSDR and Quisk. 2011 January: The QEX article was published. 2010 May: The hardware and software are finished and work well. I submitted an article describing this project to QEX. 2010 April: Thanks to an email from Jeff Millar, WA1HCO, I now understand the high noise figure. He calculated the noise figure of the ADC alone to be 30 dB. The preamp gain is not sufficient to dominate the noise figure, and using the usual formula F = F1 + (F2 - 1) / G1 gives the net noise figure I observe. I do not want more preamp gain, as that would degrade the dynamic range. I have an additional preamp external to the transceiver that I can switch in for 20 meters and up. 2010 April: The FPGA software is almost finished. I added the ability to specify the decimation rate in the Quisk config file. SSB transmit and receive both work. 2010 January: The receiver noise figure is 24 dB. Although this is not bad, the preamp noise is dominant, and I was expecting a noise figure closer to the preamp noise figure of 7.5 dB. I do not understand why the noise figure is 24 dB. The transmitter audio is good. The output from a low pass filter connected to the DAC transformer is 2.2 dBm at 1.9 MHz, 1.6 dBm at 14.2 MHz, and 0.5 dBm at 30 MHz. The 20 ma peak (10 ma after the transformer) from the DAC to parallel 180 and 50 ohm loads would give 1.85 dBm in the 50 ohm load. 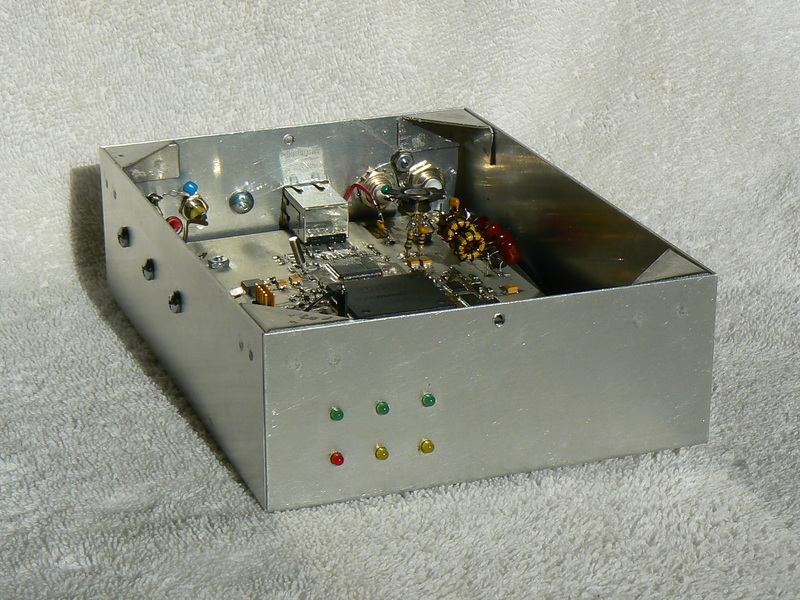 This goes to a 2N5109 amp with 15 dB gain, but the IMD is about 35 dB below one tone. At this power level, lower IMD is expected, so I plan to reduce the gain. 2010 January: The FPGA software now generates both CW and SSB. Two-tone output is generated in audio and sent as SSB, and looks good. 2009 December: This project is not finished and currently is under development. The board is done and all the parts are mounted. Receive mostly seems to work, although the noise level is higher than it should be. The transmitter generates sin waves but not SSB.